It would have been a quiet life, lived in the service of God and a good people – except for the war. A grainy photo from an old album. 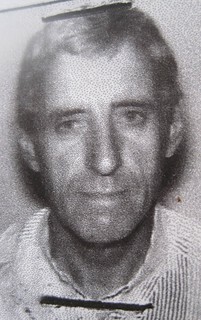 Frère Maurice did not document his life. Brother, or Frére, Maurice came to DR Congo, then Zaire, at the age of 29 as a Catholic missionary. 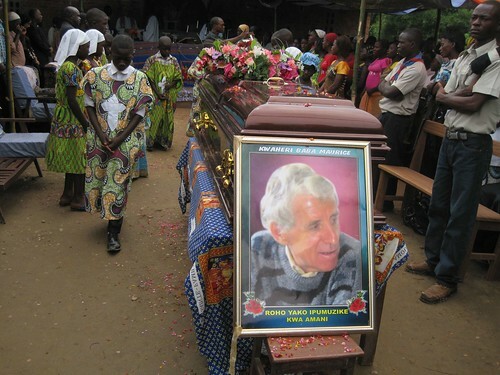 He worked for the diocese of Kindu at the rural farm in Katako. In 1992 he left the church and in 1995 he married Françoise Ongeli. Born in Katako, Françoise says her friendship with Maurice dates from 1978. Katako is just to the west of Kindu. This map shows Frère Maurice’s forced marches when prisoner of the Mayimayi. 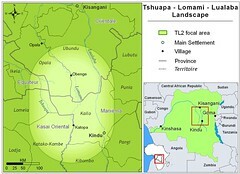 Congo’s war-of-many-sides (see reference below) was divisive, ethnic and seemingly interminable in Maniema. The morning of April 3rd 2002 the Mayimayi pulled Brother Maurice (as he was still called) from their house in Katako. They stripped him, for fear he might flee, and made him walk naked 8 km, to the village of Shoko on the river Kasuku. For two months he was held in the local prison of the village chief – often being forced to sleep naked for fear he might flee. Françoise was able to stay close, to find food, to tend as possible. 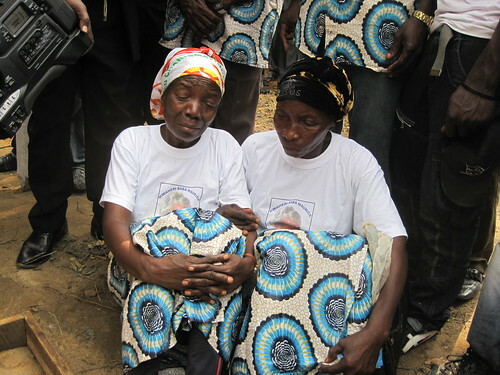 Françoise (in white head scarf) at her husband Maurice’s graveside. Why was he arrested? It was a time of suspicion and wild accusations. Why, the Mayimayi reasoned, would a white man stay so close to Kindu during war and chaos? Certainly, he had a hidden cash of arms — he managed an underground defense for the Rwandans – he was in radio contact with an enemy Rwandan supporter, who, unfortunately was a brother to the Bishop Mambe. The radio was long since dead, there were no arms, there were no holes in the ground — but still the suspicion was alive. The Mayimayi commander, general Kabambe, who is now a commander in the Congolese army (as a result of a policy of forgiveness and integration) sent a group of Mayimayi soldiers to move Brother Maurice from the prison in Shoko to the priosn in Pembeliba. 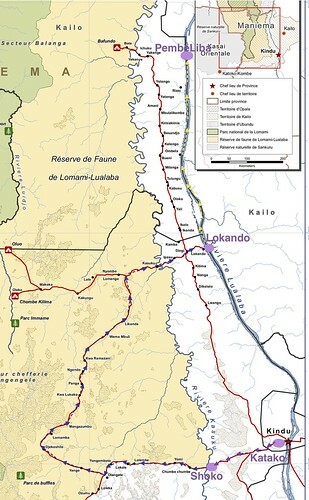 Françoise and Maurice walked 128 km on foot, this time in clothes but with little food, to the port of Lokando. From Lokando they were taken by dugout downstream to the old ivory post of the nineteenth century – Pembeliba. 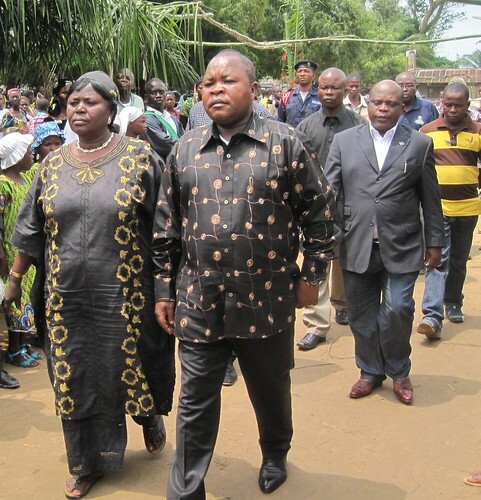 The chefitaine of the Bangengele and the governor of Maniema arrive at Frère Maurice’s funeral. After a year in prison in Pembeliba, Brother Maurice was released through the intercession of the Catholic Church, the UN mission and the good will of General Kabambe. His death by cancer, near his home at Katako, came less than nine years later. His large family of friends, supporters, family-through-marriage, and admirers gathered at Katako for his funeral. A departure of dignity and humilty. A man much loved. This entry was written by Terese Hart, posted on 2012-06-18 at 11:32 am, filed under History of TL2, Kindu, Law and Order. Bookmark the permalink. Follow any comments here with the RSS feed for this post. Post a comment or leave a trackback: Trackback URL.